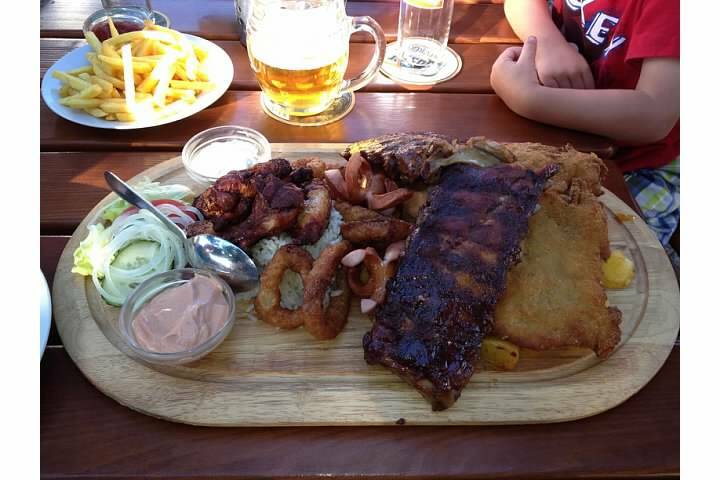 The top layer consisted of two pieces of schnitzel, two sets of ribs, two Frankfurters, chicken wings, and onion rings. Underneath was a bed of buttered rice and roasted potatoes. This plate plus a digestive that tasted like a Unicum and Coke was ours for a mere Euro 14,90. I would love to report that we gave it our best shot but were overwhelmed by this meal, and unable to eat it all. Alas, with the help of some Gösser specials to wash it down we ate every last bite. The meal was great and this is the type of restaurant that we love to visit. 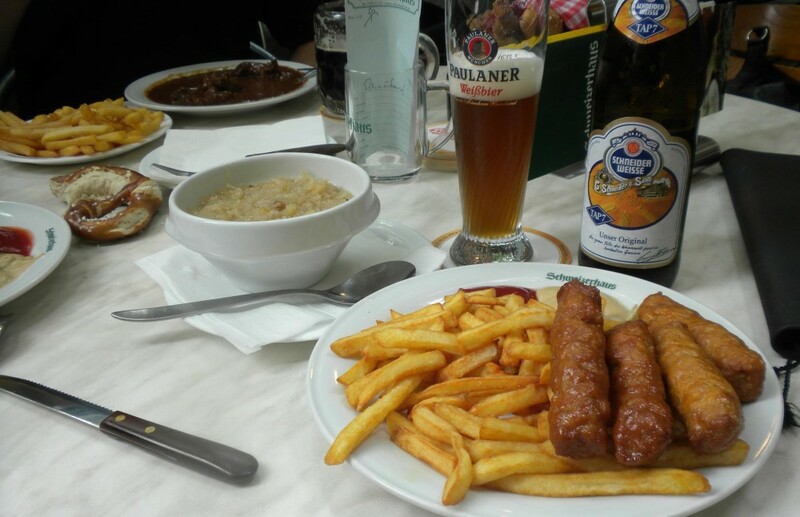 It is a typical Austrian restaurant with an outdoor beer garden that serves Viennese and Styrian specialties, with an emphasis on meat. When you first enter the beer garden, you see a large roaster with several entire chickens slowly rotating on spits. How can you go wrong with a restaurant that serves copious quantities of meat and beer, I ask you. We’ll be back. After another less than pleasant excursion to the local Metro (Austria’s version of Sam’s Club), we were looking forward to dinner at the snack shack in the Baumax parking lot. It is exactly what it sounds like: a shack set up in the parking lot of a home repair supply store that sells food and beer… and stiffer drinks in case you had a rough shopping experience, which we inevitably do with a two- and three-year old in tow. To our dismay the snack shack only had three hot dogs left, so we headed into the nearest village to search for a more substantial dinner as our two-year old shrieked “huuuungry! I am huuuuuuungry!” We parked in front of the first restaurant that looked open which, fortuitously, turned out to be the heuriger Weinort. We ordered a viertel of wine each and grape juice for the kids, who by this point had resorted to eating ants off the ground. 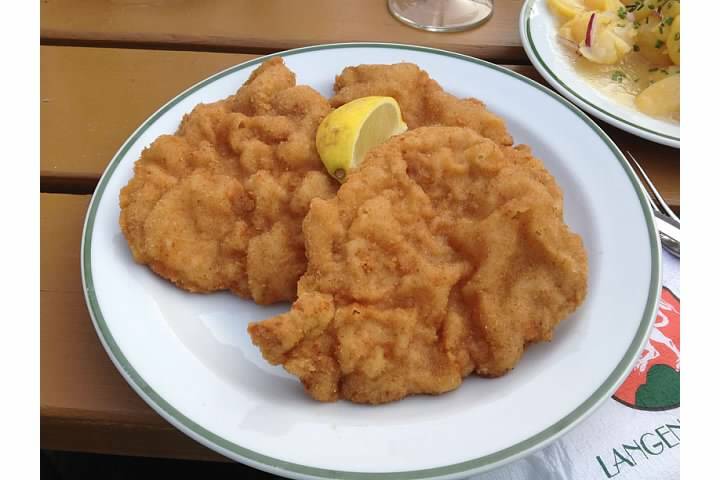 My husband ordered the large portion of schnitzel, and the menu did not lie when it said “large.” It took both of us, with a little help from the kids, to finish the three large, tender, and perfectly fried pieces of pork schnitzel. It was accompanied by potato salad, which was almost as good as the main itself. Austrian potato salad is not generally prepared with mayonnaise; instead, it has some sort of tangy vinegar, red onions, and fresh herbs. I need to learn how to make this, maybe even in time for our 4th of July BBQ. 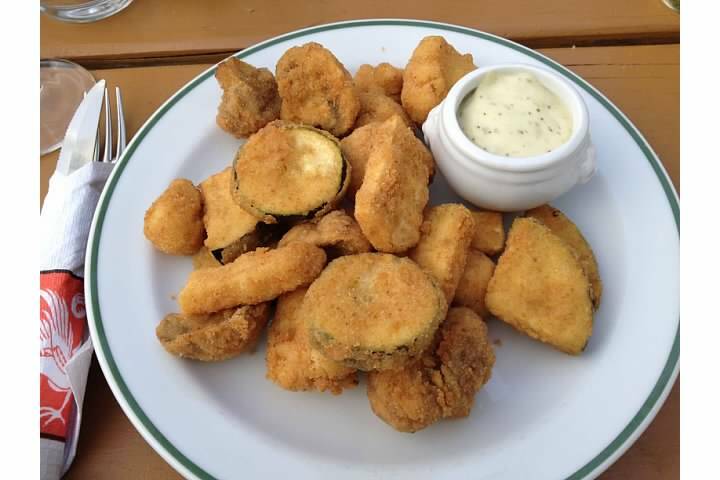 I ordered a plate of the gebackene gemüse, which is an assortment of deep fried vegetables served with tartar sauce. In this instance the gemüse consisted of mushrooms, cauliflower, zucchini, eggplant, and an unidentified yellow, fibrous vegetable (I think it may have been a type of squash). 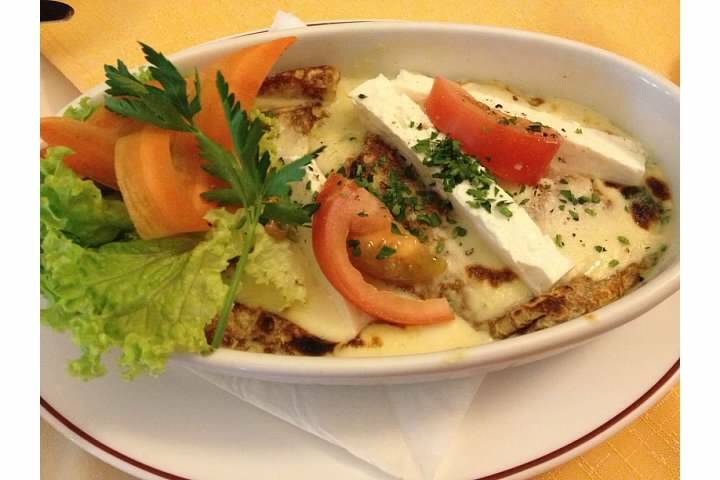 This dish is very popular in Vienna and I’ve not encountered a bad version yet. Even though I enjoy the fried vegetables, I don’t think I’d attempt to make this at home because I dislike the smell of deep frying food. Maybe once we return to the States if a) I acquire a deep fryer and b) we have a house with a kitchen with good ventilation. I would like to learn how to make a good tartar sauce, though, so this is now on my list of things to learn to make. 1. Melt some butter* in a pan and fry the mushrooms until they begin to release their water. Remove the mushrooms from the pan and set aside. 2. Melt some more butter in the same pan. Add onions and bacon, and cook until the onions begin to brown. 3. Return the mushrooms to the pan with the onion/bacon mix, then add the broth and cream. Add salt, pepper, and thyme, and stir well. 4. Bring mixture to a simmer and continue simmering until the liquid has noticeably reduced (15-20 minutes), stirring occasionally. 5. Stir milk into the sauce until the sauce reaches the desired consistency (the sauce should be creamy, and not too thin). Remove the pan from the heat, add parsley, and add salt and pepper if necessary. Cover. 6. Prepare schnitzel as you normally would. 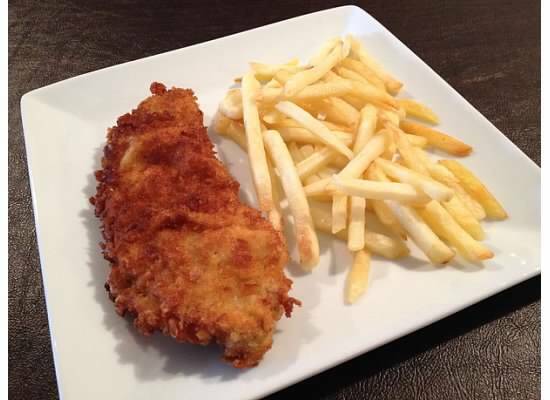 (Here is the recipe that I use for schnitzel.) 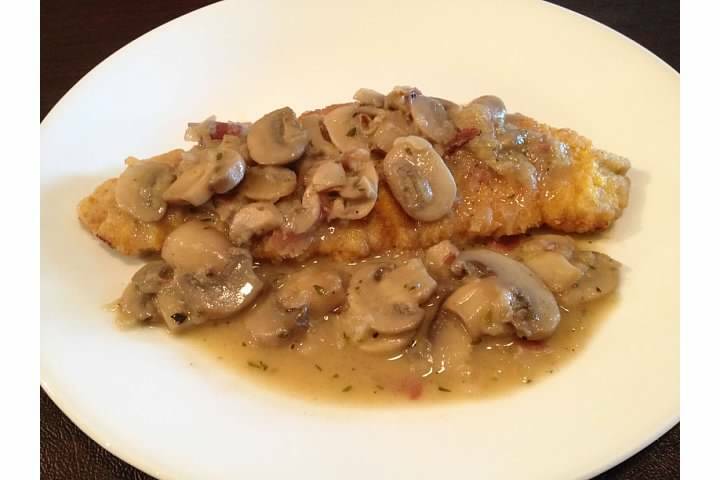 Pour some of the sauce over each schnitzel cutlet and garnish with sliced mushrooms and lardons. 1. 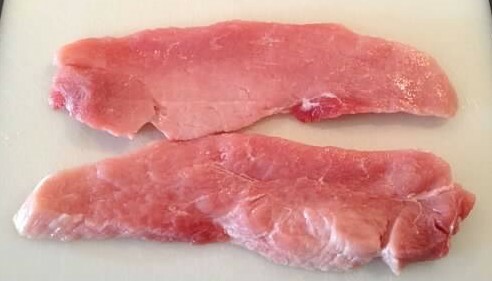 If you can find black forest ham (or something similar), it would be a more authentic flavor than bacon. 2. There is no set amount of butter that you should use, so do it to taste. I am generous with my butter and melted enough to coat the bottom of the pan and the mushrooms: at the very least melt enough to coat the bottom of the pan. 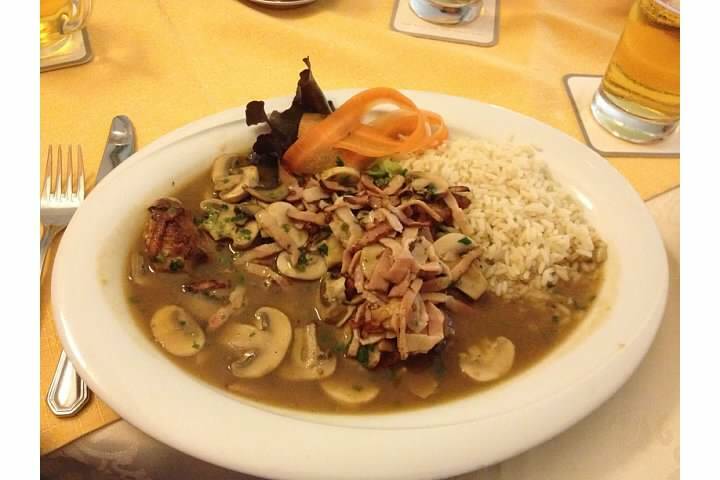 This is schnitzel topped with lardons and sliced mushrooms, served with a ham and mushroom gravy. So delicious, yet the recipes that I have found look so easy. I plan to make these in the very near future, so stay tuned for a recipe. This is gratined crepes filled with sheep cheese and spinach, topped with rectangles of sheep cheese and tomato. They were so heavenly that I would have licked my plate, had we not been in public. I have no experience with crepes, however, so in order to recreate this dish I first have to learn how to make crepes, then figure out what kind of crepe this is. It is denser than the crepes I’ve seen, so maybe they are made with a different type of flour? This will take some experimentation and hopefully in the not-too-distant future I will have a result worth sharing here. “Schnitzel” refers to any meat that has been pounded thin: I’ve seen veal, turkey, chicken, and pork schnitzel on menus here. “Wiener Schnitzel” specifically refers to veal and according to Wikipedia, it is the national dish of Austria. 2. Make a few incisions around the edges of the meat and salt on both sides. 4. Heat oil in a non-stick pan and fry the prepared cutlets on both sides until brown. Drain on paper towels and serve with a wedge of lemon.